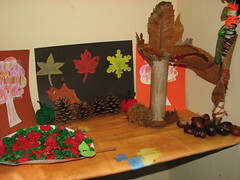 Posted by snoozerider in autumn, kids craft, seasonal table. This last week has involved lots of craft projects for the seasonal table. Waif has been particularly enthusiastic about this. “What can we make for the autumn table now, mummy?” being the refrain of the week! Here’s a snapshot of the table in progress. We have woollen apples (instructions here), an autumn-themed magic wand, a kitchen roll tube autumn tree, painted stencil autumn leaves, a tissue-paper paper plate apple and various items collected on nature walks. 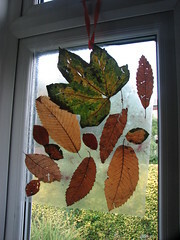 As well as these, this morning we have made an autumn leaf sun catcher to hang in the window. 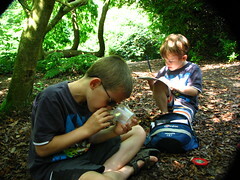 Waif laid the leaves on a sheet of sticky back plastic, added red and gold glitter, then we pressed another sheet of the plastic on top. This is hanging in the window by an orange ribbon and looks lovely when the sun shines through.